I’ve never made them before, but I head over to the store and buy eggs, cilantro, tortillas, a can of chipotles in adobo, and canned tomatoes. The supermarket does not have ancho chilies and I felt deflated, but I figure it’s a last-minute brunch I’ll use what I can get. I run to another supermarket because paying $7 for queso fresco doesn’t seem right. I don’t know if my recipe is anywhere near authentic, but it tasted pretty good. Puree your tomatoes in a blender with the garlic, sauce from chipotle can (to taste) and onions. Pour into a pot and simmer for 10 minutes or so until the flavors meld, add S + P. Meanwhile, take your tortillas and fry them in oil until crispy and set aside. Fry your eggs (we like sunnyside up, but I think scrambled would be great too.) Throw some tortillas in a bowl and pour the tomato sauce over it. 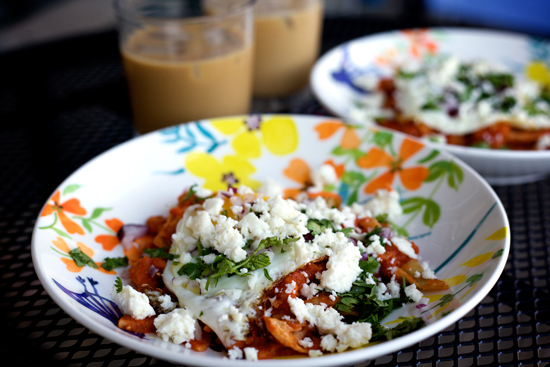 Place an egg on top and garnish with cilantro, red onions, and queso freso.